← November week 2 – Are you for the birds? The interplay between lines, curves and light is the basic ingredient for photography. 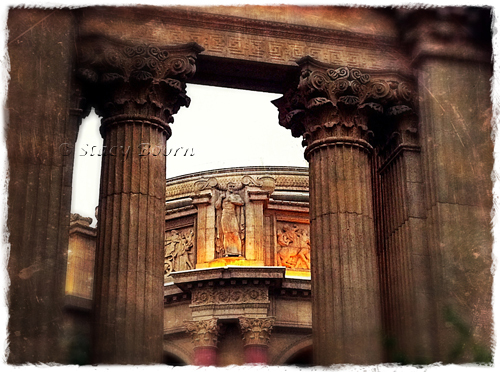 One of my favorite locations to work these elements into an engaging composition is San Francisco’s Palace of Fine Arts. Dawn is a good time to begin walking this area while the buildings are still illuminated by lights and the sky begins to transform from pitch black to subtle hints of royal blue. Winter sunrise light has a magical feel. Trying to capture that emotion, I visit the Palace repeatedly. First-light streams between the houses that line the streets perpendicular to the pond in the foreground, casting a warm glow on the migratory ducks that often gather there. But it’s the dome that catches the first sun-rays which then work themselves down to the water’s edge. The pastel orange and amber hues of the palace become blazing vivid colors at first light. The scene is almost too saturated to photograph. But knowing the cause of the saturation adds to its exuberant awakening. Thirty minutes later the light will begin to flatten out. Often this experience of first light is tempered by foggy mornings that can blanket the area in 50 shades of gray. Depending on the amount of wind, you can capture on the water’s surface anything from a mirror image to a rippled resemblance of the edifice. Both these and every variation in-between are worthy of immortalizing with an SLR or iPhone. These intersections between nature (the light, the sky and the water) and human art forms are beautiful testimonies to the space we are called to share and create within. Seeing ourselves as co-creators with the universe is awesome. I believe from this perspective flows a greater appreciation of the earth and the gifts of her resources, and with that appreciation comes the daunting responsibility to respect and help safe-guard the beauty and the life that is around us. Nelson Mandela led the struggle to replace the apartheid regime of South Africa with a multiracial democracy. Imprisoned for 27 years, in 1994 he went on to become his country’s first black president. The world will have a hard time finding the likes of Mandiba in the days ahead. 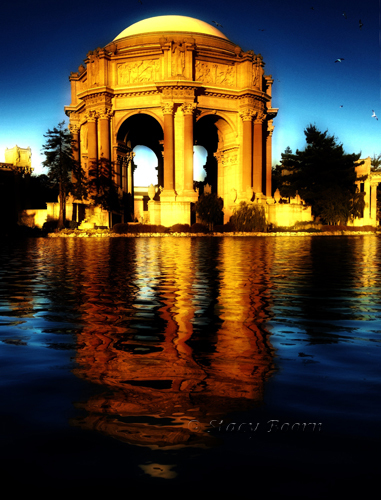 But seek and you shall find – birthers of rainbow-equality are all around us. Perhaps we just need to stand in awe of their first light and move forward with their challenging and revolutionary images of freedom. 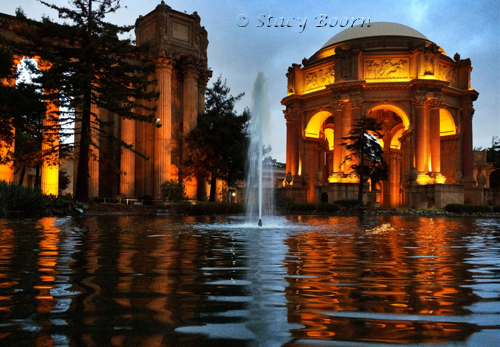 This entry was posted in Weekly 2 and tagged First Light, Palace of Fine Arts, San Francisco, Stacy Boorn. Bookmark the permalink.